Here’s how to sew and turn narrow fabric straps for a dress, purse or other sewing project. The turning technique can also be used to turn other small pattern pieces, such as the arms and legs of a doll or teddy bear pattern. An alternative, shortcut turning technique is also described at the end of the step-by-step sewing tutorial. 1. Select and cut the fabric for strap. Lay some piping cord, ribbon or old shoe lace on the right side of the fabric. 2. Fold the fabric across the cord and line up the edges. Sew across the end of the fabric, making sure to catch the piping cord. 5. The strap will start to gather along the piping cord. 12. Sew the strap to your project, following your pattern directions. In a pinch, a simple safety pin can be used to turn a fabric strap. If the strap is very thin, use a small gold safety pin; if the strap is wider, use the largest safety pin that you can move through the fabric tube. 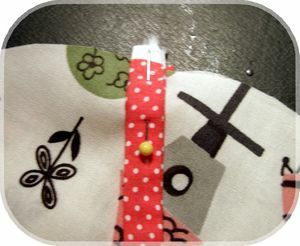 Simply attach the safety pin to one end of the strap, with the closed end of the safety pin pointing inside the tube. Use your fingers to move the safety pin through the tube, so that the end is gradually drawn through the inside. Once the safety pin emerges from the other end, pull it gently until the tube is turned completely, so the right side of the fabric faces out. Done! Adapted from the original wikiHow article on How to Sew and Turn Narrow Shoulder Straps, under Creative Commons license 2.5.